Just yesterday I was reading this thread on the forum about standards. One of the points was about the connectors on the Sanguinololu boards not necessarily being up to the job for the currents that the heated bed need. Lo and behold, today while calibration my bed stops heating. This is what I found!! Might looks innocuous enough to the casual observer, but that's a bit scary, as leaving the printer unattended could result in a fire. Not that I've been brave enough to do that yet. I then rates my scrap pile to see if I had a suitable relay which could be used instead. There went about 2 hours or so of fiddling and the end result?!? Didn't work. So for now I am back to wiring it up the old way as it is Easter Sunday with no hope of buying any kind of spares today. I'll be researching this further and posting on the forum about it, as I think this is something we really need to do something about. I would have thought it shouldn't be that hard or costly to offload the heating so that it runs of a separate circuit and the Sanguinololu is merely doing the controlling, not actually providing the current. Problem is, I can assemble and fiddle with electronics, but I don't know where to start when it comes to designing. You should at lease use all four pins and four wires. 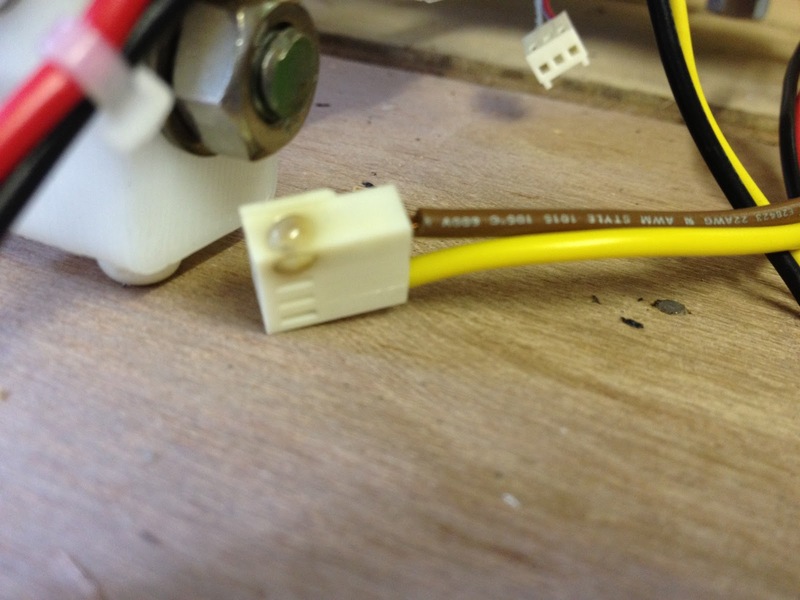 I use 40/0.2 cable and take one connection from the tab of the MOSFET with a ring terminal and the other direct from the PSU +12V. Thanks nophead. I'll take a look at the wiki and sort out the wiring today!! Those crimp connectors are only rated to 1A (3A for good ones) whereas your bed takes ~11A. I use screw terminals which seem to work fine. Thanks Triffid. I'll take a look at the link you provided, and as mentioned above, plan to sort out the wiring today! !